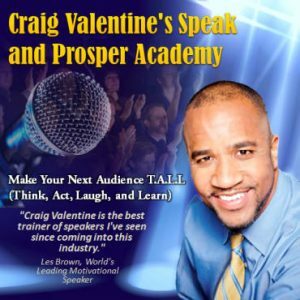 Click here to set up a free phone consultation with Craig to discuss how to make your next event your best one ever. By now you know this attitude weighs down even the most talented and dedicated teams and keeps them from ever rising to new levels of success. In today’s times, organizations have two options: 1. Change. 2. Die. Raise the energy and morale even in the midst of the change! This is one interactive and motivational program you cannot afford to miss! Turn your team into Champions of Change! You are truly the best speaker I have ever heard and my first day back in my sales territory I was charged. I let everyone know how you changed us with you dynamic inspirational speech. We broke a district record by selling 154 registrations. All of us realize that this success was a direct result of our keynote speaker. I absolutely loved your presentation in Saint John on Saturday. You were brilliant. I’ve been attending business and association conferences for 15 years and yours was one of the best that I have had the pleasure to see. I had an absolute blast and learned a great deal. I just wanted to sincerely thank you. “You were WONDERFUL!!! Everyone is STILL talking about you!!! I am even trying to practice your tips! You made me aware of ‘practicing’ and putting my learning to use daily!